This s is a video interview with Bjorn born in Norway who has lived in the Philippines for nine years. How he chose Philippines for apartments, hotels, language, neighborhood, business with the pros and cons of living in the Malate, Ermita, Mabini neighborhood of Metro Manila. He has been an Expat for 30 years, living in many countries working in investments. 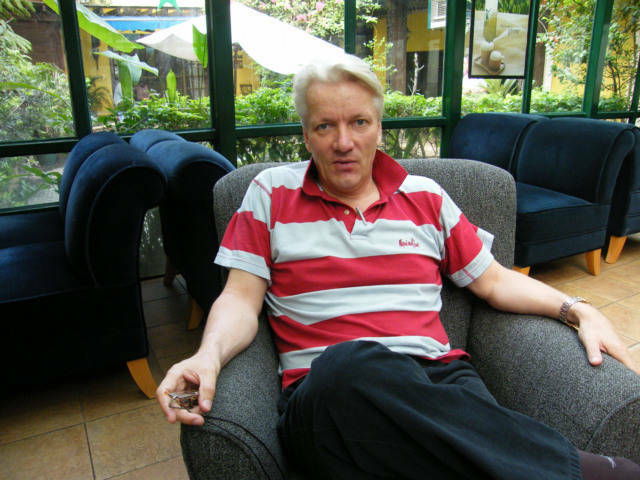 Photo of Bjorn in the Malate Pensionne Hotel, I guess this is some type of common use Air Con room for the Starbucks, but available to be used by the residents of the Guesthouse. There is a courtyard area behind him that leads to the entrance. He spoke a little more politically correct than I was hoping, however this is Bjorn, a man who has lived in Manila for years. I feel the idea of living in room for 15 dollars per night, and he chose this above both and apartment or even a Five Star Hotel needs to be heard. Many expats go and live, however they travel and live like a tourist, never slowing themselves down to re-think the proposition, living is not the same as being a tourist. Thanks Bjorn, and hope the future is great.